Running out of pages in one’s current journal is not the only reason for retiring it and moving on to a new journal. It has been a very long time, in fact, since I filled a journal right up to its very last page. The way it usually happens, with me, is that I will sit down to my semi-regular ritual of journal-keeping, and feel a powerful aversion to writing in that journal. As though the things I want to write about don’t belong in that particular book. My journals usually span a period of 5-7 years…a good chunk of time in which major life situation and personality changes might occur (I’m not talking about the fanciful myth that claims we generate completely new bodies every 7 years!) that find me a different person, at the end, from who I was when I started the journal. Soon after we arrived in Australia (sailing from the Philippines, stopping along the way in Timor L’este for a month, all in all taking three months to get here) I found that I could not bear to write in the wooden-bound journal (the one named, no kidding, Tagebuch) I had brought with me. Tagebuch, and everything within it, belonged to the tropical archipelago of small limestone islands where Kris and I had lived for 6 years, in a fisherman’s ramshackle beach house an hour’s walk from the next cluster of human beings. There was no internet, mobile phone, digital camera, or laptop. We didn’t have jobs. We had no electric power of any sort—no lights at night, no fans, no television, no music—nor plumbing, and the little bit of money we had, we made by selling our paintings and handbound journals at galleries, exhibitions and craft fairs elsewhere in the country. There had been a huge tropical garden (my pride and joy) surrounded by 2 hectares of coconut plantation, and a jungle looming behind us that rustled with the movements of monkeys, pangolins, civets, pythons, tree shrews, sea eagles, mysterious night birds, and the rare, endangered local peacock pheasant, tandikan. I wrote my journal in the mornings, at a table standing among hippeastrum lillies in the garden, or at a desk in the bedroom on wild monsoon nights, with half a dozen candles burning for light. We would sit in the doorway of our bamboo shack, senses alert in the total darkness of the night to every firefly or leafy crunch, every susurration of the sea in its different moods. We spent our days painting, marbling, reading or binding books; we took breaks to comb the beach for tumbled glass or chambered nautilus shells, or walk the twisty dirt roads of the surrounding countryside. We moved through cycles of making art, making love, making coconut curries, making strong loaves of peasant bread. This was the real world for us, and we seemed to exist outside of time. How could I, arriving in Darwin—a whirlpool of working & earning & spending, of material culture, of social interactions, of self-assertion and ego-building, of status anxiety, and the never-ending struggle to establish one’s meaning or worth in empirical terms—continue to use my jungle book, my turtle-moon-hippeastrum-poetry-green-glass-seasnake-soulmate-candlight journal? It felt like a desecration, and that’s how I knew it was time to make a new journal. 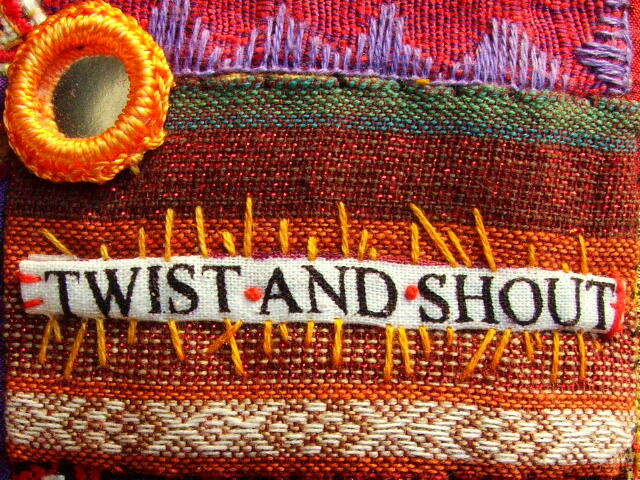 Twist and Shout has been my Darwin journal since 2007. The name was actually printed on the selvage of a quilting fabric I had used to make the covers’ patchwork with. It seemed to fit with the way I felt about Darwin at the time…the teeth-grinding busy-ness of the place, the commerce, the social and racial tensions, the clashes between individuals brought on by drunkenness or just selfish intolerance, the big hurry that everyone was in to get someplace else. It contains the story of finding my place within this small city, of meeting friends and carving a small niche for myself, of making a home and coming to belong here. It cobbles together what I have learned about Northern Australia and the things I have come to love about the place. My very first fresh peach, apricot, raspberry, pomegranate were experienced here. My first fresh fig (a moment worth many chapbooks of poetry) and my first octopus (a moment worth many cookbooks). My encounters with crocodiles, flying foxes, frilled lizards, wallabies, kangaroos, and a Clydesdale horse so big that I thought of Norse gods. It might mention some of the new toys and tools that living here made it possible to acquire. My job experiences as cleaner, as gardener in a plant nursery, as kitchen hand, as back-to-uni student, as craft teacher. My delight in bicycles and the daily love I feel for Darwin’s meandering, tree-lined bicycle paths through shady parks full of ibises, plovers, and sporty types, appears everywhere in its pages. It includes the year I rented an art studio, and the fun of putting together my first two solo exhibitions. The accounts of trying to learn a third language, to study printmaking, silkscreen printing, and doing a dressmaking course, are here, too. I made my own clothes for the first time here, on a 70-year-old sewing machine that I bought within a month of arriving in the country. Of course it documents the continuing importance of the sea in my life. 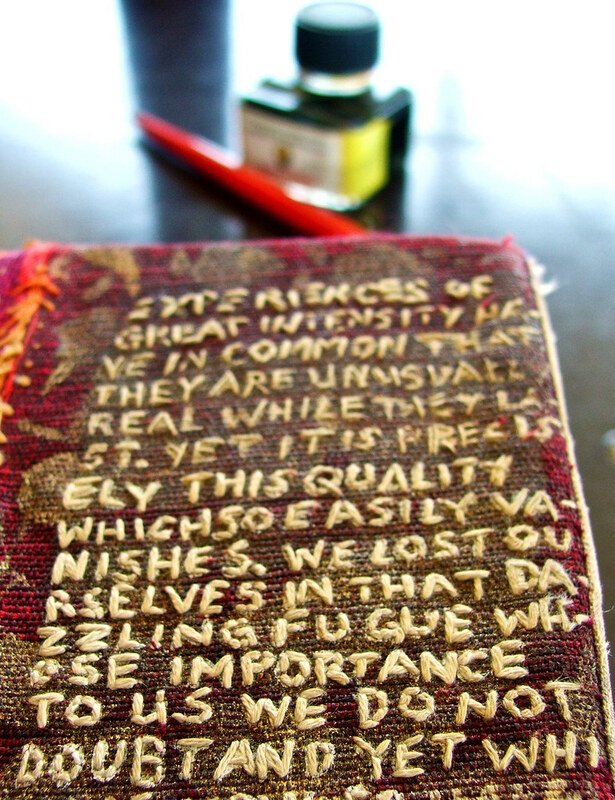 On the whole it has been a good companion, this embroidered and patchworked book of 500 pages (400 used)—so full of paint and inclusions that its covers are permanently agape—although I did not write in it as regularly nor as copiously as I did in the last journal. I was much more bound by time during this period of my life…well outside of the standard rat race, but a rat on the sidelines, nonetheless…with unexceptional jobs, keeping regular hours, having bills to pay and other financial commitments, watching in growing anxiety as the days, months, years flew by because my attention leapt from payday to payday as across stepping stones…the rest of the days falling, unremarked, between them, and flowing away like water. Last week, although there was plenty I wanted to write, I felt unhappy about having to write it in Twist & Shout. I’ve learned to recognise this feeling immediately, and so put away my pen and ink bottle, and re-read the journal, instead. The signs were unmistakable: some entries were fun to read, and a little bit was of continuing importance, but most of what I had written was already obsolete. No longer useful or even relevant to me, the person I was in 2007 had been left behind. I had moved on, and at some subtle point had turned a corner, from which my 2007 self could no longer even be seen or remembered, and the way back had been rubbed out behind me. Only the present moment is real, though I have some vague ideas about the way ahead. In my next post I’m going to write about making the transition between an old and a new journal. I suppose one could just drop the old journal, and start in the new immediately, but it seems a shame to treat an old friend and one-time constant companion that way. It seems ungrateful, somehow. There are rituals of gratitude and farewell for tools and objects—as there are for friends and loved ones—to soften the sharp edges of change and to prepare oneself for what might lie ahead. I thought I might share my own practices here, not so much for you to follow as to help you think up rituals of your own. Lovely to read about your rituals and your passion for journalling. The older I get; the younger I feel, except early in the morning as I get out of bed. Or when I have to go up more than one flight of stairs carrying groceries. Reblogged this on mishellhmm + wordpress. Reblogged this on Indubitably Brazen's Blog. 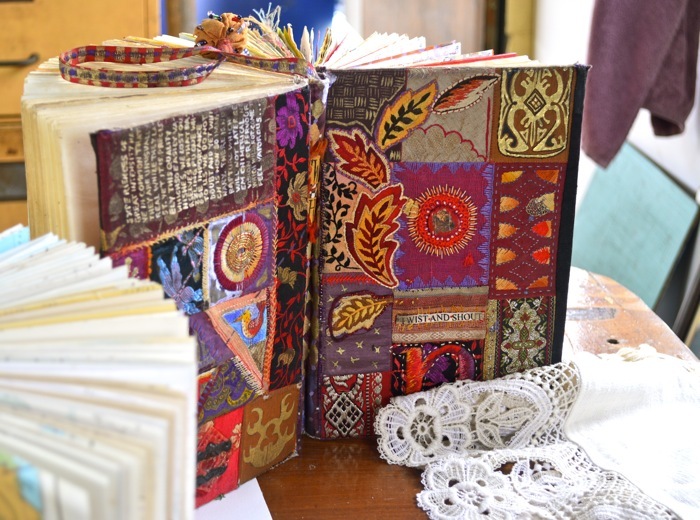 Beautiful photos…love the vibrant colors of your journals! I also get the feeling that I need to change journals in different stages of life, I thought it was just me! Though I usually start a journal over the summer, then abandon it, want to start writing again but it just wouldn’t fit. I also started a new journal when I moved into a different county but I never stay anywhere long enough. I want to get a new writing journal now because I just write all over the place and then can’t find anything! That last photo is so beautiful! We love it! Such a strong sense of spirituality and purpose. Beautiful photos and words. thank you for the inspiration. nice blog. Simply Lovely! What wonderful want to embrace inspiration. This blog post is so colourful that it filled my brain with a rainbow 🙂 Awesome! I love the thought of writing in journals, especially when they’re hand-crafted. And in 5-10 years if not 30, I’ll go through them, laugh at them messy hand writing, and give them to my sons. Forgot to tell you when I uploaded!! So sorry! Great, Jeff, thanks! I love that your daughter got you started…that you continue to journal is after she’d gone is amazing. She gave you an abiding gift. Hey will you pls reblog my post or follow me? Cause your blog is great! I love love this post it read as it should be a blurb in your journal. Just last week I had two stacks of journals on my bed scratching my head. I have thought certain words need to go in a certain journal as well. My only problem I can jump between 2 and 3 in a month… Overall I love journalling and going back to reflect. From this post alone I would pay to read yours.. Thanks for sharing. I don’t have a word for how beautiful your journals are. I would so love to learn the art of book binding some day. I have so many ideas, but I lack the skill. I have a different journal for everything. Maybe someday. Your journals are synergistic, they look, like they feel, colorful,warm,and depicting the seasons of your life. Perhaps you should not write in that one, but begin a new season…after season after season…. I so enjoyed reading your blog thus far…your creativity is truly inspiring! what an awesome story and a nice book. Thank you for sharing this. Ah no. Just so happy to see you on FP, Nats because truth is, I have been thnking aaaaaaaall along, smallestforest merits a lot of spots in FP’s arts category if only. Your triumph is my whew! medyo. Must be the new profile pic. Heh heh. ‘Di nga, I’m always surprised if it gets picked. Go figure! Guwapo ng profile pic natin these days, ah…I didn’t recognise you at first. Naks. Moving along, will be loose among the islands of the beloved mother country (cown-tree) in first half of Feb., wanna meet up? I’m broke, so nothing over-the-top, but I’d love to say hello in person. But of course Nat give me the honor to feature you in MALATE. you are so both creative and brilliant! mabuhay! Oh, I love, love, love this post! It took me to another place, and also got my creativity flowing. I can feel that familiar itch in my fingers to write, create, and breathe. Journaling is such a great way to do all three! Thank you, it touches me that you could relate; before I wrote the post I had a look around to see what else had been said on the subject, but didn’t find much (though I didn’t dig very deeply into search results) so I wondered if anyone else felt this way. So glad that putting the post together seems to have struck a chord somewhere. Congrats on being Freshly Pressed – that’s how I got here. I am so impressed with the way you create your journals, decorate them, give them a personality. I have kept journals now for over almost 40 yrs now and they have certainly changed over time, matured from the cute little handmade in India diaries to large notebooks now. I actually just found a visual journal I started keeping some years ago that included collages of pictures I had found, some things I collected in nature that would fit between the pages of a book – I noticed I wrote differently in response to pictures, more poetically and more focused, haiku like compared to my long-hand journal writings Now I am wondering: if I decorated my journal in such a tender loving way, would it inspire my writing in a different way? Always trust your own artistic instincts! Nature is always the best inspiration for me, too. I am so happy I read this. I have kept journals for years .They are piled up. You have given me food for thought. Thank you. Great blog. 😀 And thank you for taking the time to read what I wrote, and for your encouragement. Really interesting! I would never want to finish a journal and then just leave it; I would probably stick more pages into the back to just have the sense of continuity. Anyhoo, check out my blog for stories and poems – look forward to sequels being released next week! Ah, so lovely of you to say so, I’m glad the post resonated with you! Thank you for the visit and kind words. 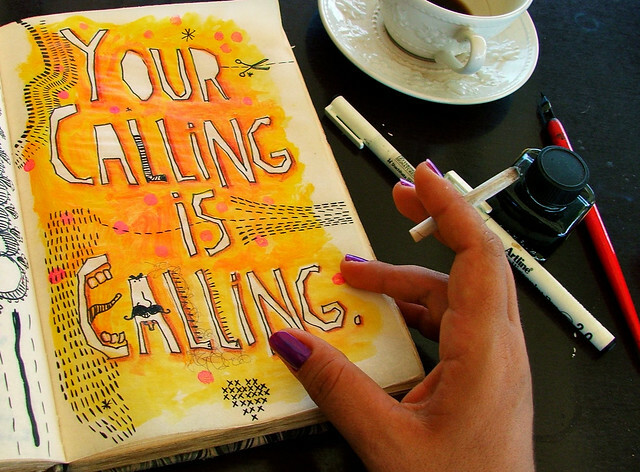 Lovely words and vibrant pictures–my kind of blog! Thank you, it’s a little erratic, I hope I live up to your praise! Yes Boss! 😉 Thanks for dropping by. Thank you! Moving slowly uphill in a crawling position, still so much to learn, but it’s enjoyable learning. Reblogged this on Curl up & dye. Amazing story! I struggle to keep an constant journal. I can only get myself to write if I need my mind cleared, meaning most of the pages are filled with overwhelming emotion…good and bad. I guess that because it is such a personal thing, you should be able to use it in exactly the way that you are comfortable with…there are no rules for something that nobody else really gets to see. I don’t always write everyday…not anymore, because life is very different and much busier for me now. It is a tool, something to use when needed. Thank you so much for visiting! I too pour it all out in mine. If anyone else read it they would think I was insane. My journals keep me sane . Yes, that’s the way it goes, isn’t it? Emotions so strong that I sometimes think they could damage me, if kept inside, fill many of my journals. Where was it I recently came across the quotation “If you bring forth what is within you, what you bring forth will save you. The prettiest journal I have ever seen! I’m inspired to make one myself! That’s awesome! Would love to see it when you do. You smoke? All the beauty. All the exotic lifestyle. All the envy you engender from those of us living drab lives, but you smoke? That is hard to weigh in my mind. The beauty, fragrances, seem destroyed now. Like seeing a wispy fairy holding a cigarette. What an awesome story and a beautiful book…Unique, Inspirational…Wonderful. You have an amazing talent to share your journey! Thank you for posting this! Wow! Your life has been a great adventure and that’s fantastic. Your journals are so creative and colorful, I love that. I thoroughly enjoyed this post – thank-you! You write so beautifully about your life – exotic or otherwise. I read somewhere once that if you write in a journal on a regular basis – magic happens – I think that’s definitely what’s happened here. It can be magic. I find it really helpful for just clearing my head of the white noise of daily life, and of working physically (via the act of writing) through my own evolution as a human being. I’ve also used it to blast through some major blockages in my life…emerging on the other side a different person. That is if you keep an honest journal, just for yourself and not for anyone to read later…the gritty stuff and not just la-di-dah pretty things or edited thoughts. It becomes a door into who you are. I am so glad you enjoyed this post, and thank you for taking the time to visit and comment. Wow! I am in awe of the creativity. I really love the idea of giving your journal a name, makes it more personal and marks an era in ones life. Looking forward to reading more of your posts. I have some funny names for journals, not all are cool or sophisticated, but then it’s a personal book and not meant for others to read, so that’s okay. The one before Tagebuch was named ‘potholder’ because of the embroidery I did on the front (a padded circle) that my mother said looked like a very elaborate potholder… 😉 Thanks for dropping by! Beautiful post and pictures! Love this! 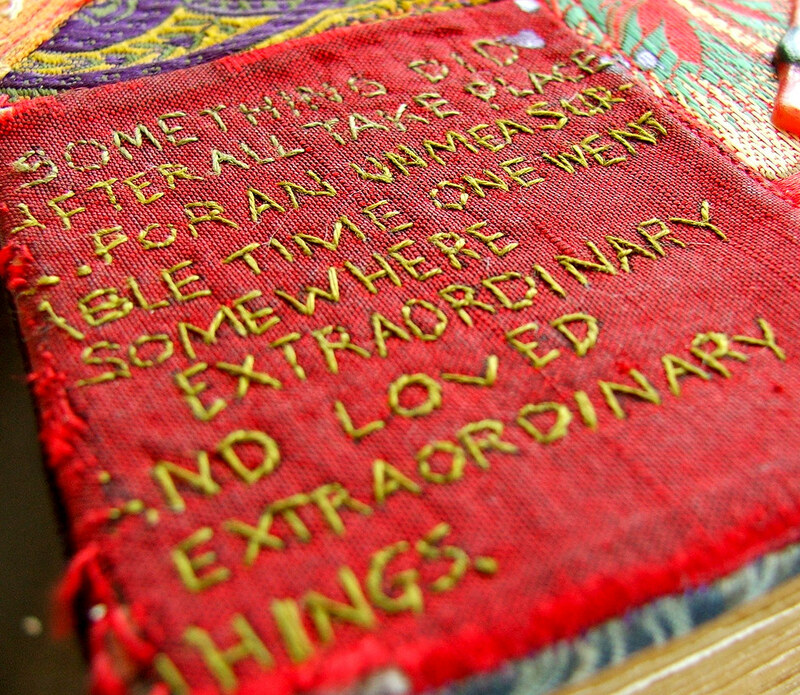 That’s a beautiful journal you made, and I love seeing the inside of other people’s private pages. 🙂 I’m sort of hoping the pages won’t be read too closely by people, but I guess that’s a risk you take when you post pictures of pages. 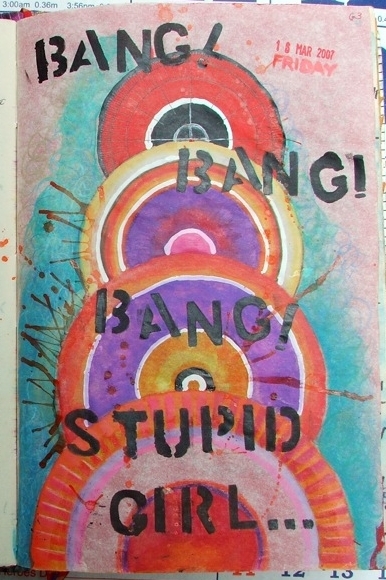 Most of the time the pages of a journal are filled with dross, but sometimes there’s a gem tucked in there somewhere. Thank you for visiting! As usual, your bright and descriptive passages shine through. I have kept a journal for a long time, not a creative, handcrafted lovely like yours, but a plain representative. After reading your post I’ve come to realize that I too have changed and the journal is now me in a past life. I live in Hawai’i, 40 years on the Big Island and am now living an entirely different life on the island of Maui. So, as I’ve have changed it’s time for my journal to change as well. I will have to think long and hard on what to name it, what it should look like, etc. I’m a relatively crafty person so will attempt to make one my own. I do look forward to your next post. Hau’oli Makahiki Hou. WAS different and exotic for a while, these days I think yours is more so, life has become more ‘normal’ these past 7 or 8 years. 🙂 Did your journal get to you? I hope it has arrived by now! Glad you thought so, Katrina, I was a little worried that the post was too long! Yes, we were very fortunate to be able to live in some amazing places, but luck is only part of it, much is sheer determination and chutzpah. 🙂 Thank you for visiting! Very nice photos! vibrant colors. I love those colors!